Manhattan Construction Company Project Manager Andrea Gossard has been selected by the Associated General Contractors (AGC) of Oklahoma as “Project Manager of the Year.” Each year AGC recognizes the project manager who has shown superior skill and creativity in bringing a complex project to completion. Also, recognized were Justin Fegel for Safety Excellence, and Matt Martinez for Industry Appreciation. Gossard, Fegel and Martinez were presented with the awards at AGC’s 76th Annual Meeting on January 16, 2016 at the Hyatt Regency Hotel in Tulsa, Oklahoma. Gossard was a 2013 OKCBiz ‘Forty Under 40” honoree and is also a Leadership in Energy and Environmental Design Accredited Professional (LEED AP). She received her Bachelor of Science in Construction Science from The University of Oklahoma in 2008. During college she interned with Manhattan Construction from 2006-2008 and after graduation became a full-time team member at the Company. During Gossard’s nine years with Manhattan, she has been involved with constructing more than $130 million in projects including work in hospitality and on major University campuses in Oklahoma. She is currently working on the $85 million Oklahoma State Capitol – Interior Renovation project. She has served on teams whose work resulted in multiple quality and safety honors including four AGC Build Oklahoma Awards and multiple other construction industry service awards. Manhattan Senior Superintendent Justin Fegel received the “2015 Safety Excellence Award” recognizing supervisors who achieve excellence in keeping our construction sites safe. Finalists for this award must demonstrate the highest levels of leadership, innovation and personal commitment to creating a culture of safety on and off the jobsite. Fegel has been in the construction industry for almost 30 years and spent more than half of his experience with Manhattan. He received his Bachelor of Science in Construction Management from Oklahoma State University in 1988. Fegel is responsible for construction of $1.2 billion in various projects. 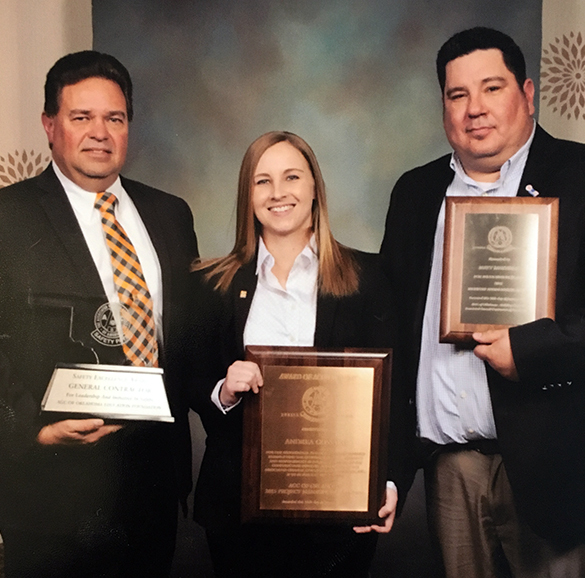 Manhattan Safety Director Matt Martinez was recognized with the “2015 Industry Appreciation Award” given each year to individuals whose contributions to the construction industry in Oklahoma were meaningful and impactful. Martinez’s contribution in training and professional development made a significant difference by allowing more than 110 people to be trained annually, instead of the 12 that had completed the program in previous years. The total impact is a change in training from 360 hours per year to 3,300 hours of training per year. Martinez has been in the construction industry for almost 20 years and enjoys a consistent track record of increased productivity hours with reduced safety incident rates. You are currently browsing the Manhattan Construction Group blog archives for May, 2016.